When I was a kid growing up in rural Tennessee, it was always a big deal when we had “company coming.” Mom would cook and clean for days to make sure our “company” received a warm welcome. Well, we have some “company” coming to St. John’s in July. As in past years, mission team members with Together For Hope will be staying in our undercroft. 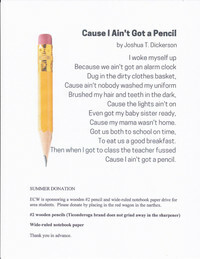 The first team of 17 volunteers will be with us July 10-16 and the second team of 19 volunteers will be with us July 17-23. These volunteers will be spending their days working on various projects in our community. When you see them be sure to let them know how glad we are to have them in Helena-West Helena for a few weeks. While we don’t have to do any “cooking” or “cleaning” for them, we can reach out to them and make sure they receive a warm Delta welcome. By way of reminder, we celebrate a mid-week Eucharist in the chapel every Wednesday at 5:30 p.m. On the first Wednesday of the month, we conduct a Healing Eucharist with unction (anointing with oil). There will be no service for Wednesday, July 4, because of the holiday. The Healing Eucharist for July will be held on Wednesday, July 11. Please keep the following in your prayers: Buddy Wheeler, Susan Worrell, Debra Richardson, David Henderson, Kathy Sullivan, Jimmy Billingsley, Larry Bryant, Lynn Jordan, Ray Worley, Chris Walters, Carol Jennings, Nancy Howe, Jim Howe, Parker Pace, Heather Treat, Julie Ann Doan, Courtney Turner, Sheila Fraiser, Samantha Webb, Donald Knapp, Katy Mouritsen, Gwen Newkirk, Blake Robertson, Rev. Arnold Hearn, P.J. Clay, Rev. Mike Wilkie, Billy Mitchell, Kappi Pillow, Kelly Namour, Rita Merritt, and Tommy McCormick. July 4, Wed: No Midweek service this week. 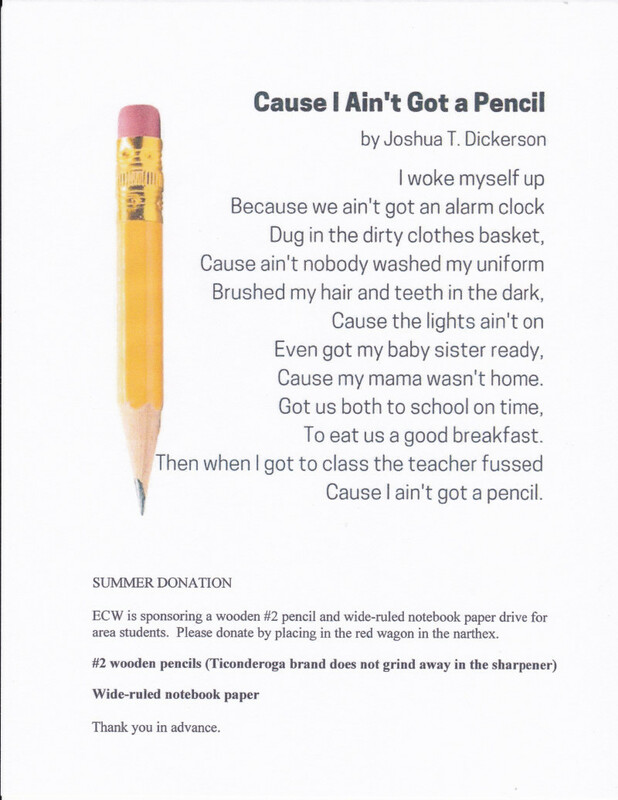 See below ECW Summer Pencil & Paper Drive for area students.